Esther Tyson (b. 1973, Barrow in Furness, Cumbria) is a British painter and printmaker. Esther studied at the University of Wales before being accepted into the Royal College of Art, London. Whilst at the Royal College of Art Esther won a travel scholarship to study large carnivores in Slovakia. This trip ignited a passion for travel, drawing, painting and observing creatures in their natural environment. After graduating from the Royal College of Art in 2003, living and working in the wilds of South Wales Esther secured a 3 month placement on Aride Island in the Seychelles. Living and working alongside biologists in the field, observing the behaviour of many bird species including the Seychelles Magpie Robin, a thrush size bird threatened with extinction and in 2005 cited on the red data list. This was an important time of learning and understanding. Surrounded by the Indian Ocean and contemplating a fear of deep water, Esther decided to apply for a scuba diving bursary through the SWLA and Dorset Wildlife Trust. Incredibly, Esther won the award and a few… weeks later became an open water scuba diver. A different world entirely, drawing underwater, the COLD waters off the Dorset coast and later, the warmer waters off Song Saa Private Island, Cambodia. Esther has been involved in projects within the UK and Worldwide, working alongside organisations such as Birdlife International (Nepal, Vultures), BTO (Senegal/Norfolk, Migration), DKM (Turkey), Esther Benjamin Trust (Nepal), Free the Bears (Phnom Penh), FFI (Cambodia), Salford Council (Salford), Royal Parks (London), SWLA, Natural History Museum (the Big Draw). 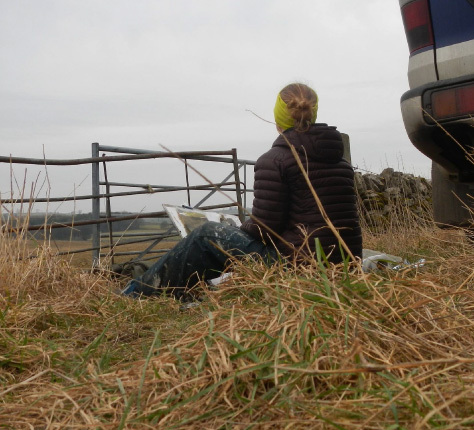 Esther currently lives and works in the South Peak District where she combines a studio and observational outdoor practice.